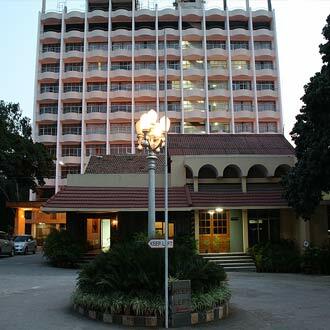 Woodlands Hotel, a 2 Star property, is centrally situated in Rajaram Mohan Roy Road. It houses 200 partially air-conditioned rooms, and boasts conference venues such as Green Arch, Sri Krishna, Mini Hall, Chandini Hall and Conference Hall, which can accommodate a gathering of 40-2000 delegates. The guests can also savor delicacies presented at Sunheri vegetarian multi-cuisine restaurant, or lounge at the French Connection bar. Check-in/out time 24hours.